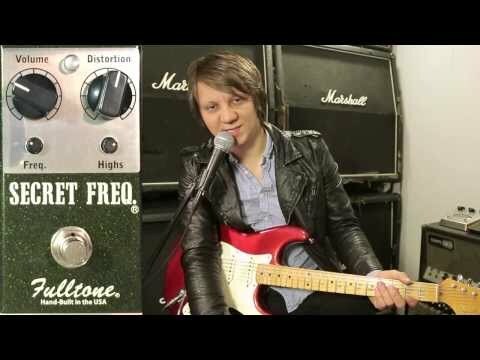 The Fulltone Secret Freq is an overdrive pedal with a trick or two up its sleeve. At low gain settings the Secret Freq provides a single stage of clipping for warm bite or clean boost. But push the gain up or play harder and the second gain stage kicks in with Geranium grit that gives the Secret Freq a character all of it's own unlike any other overdrive pedal from Fulltone or from anyone! So what's the 'secret'? Well the 'frequency' control gives you up to a 12db active EQ boost on a narrow band (the secret frequency you see!) of the midrange. The frequency is tuned to the critical range that affects how your tone cuts through a busy mix, so you never have to worry about getting buried in the mix again! Another touch-sensitive, dynamic, natural sounding overdrive/distortion to confuse the marketplace filled with Fulldrives, RC's, AC's, Tim's, and about a hundred others made by one-man-shows with the word tone in their names. Yes it does the normal gig-friendly TS-thing and the Clean boost thing, but the 'Freq has WAY more tricks in its bag.